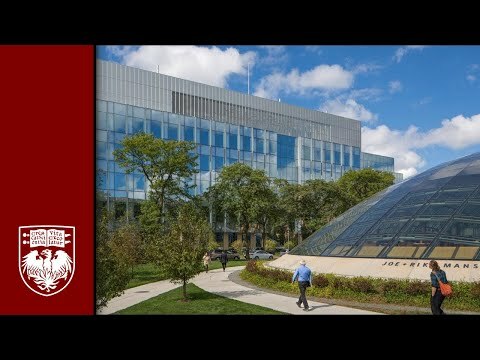 The University of Chicago’s new William Eckhardt Research Center brings together its first molecular engineering program and Nobel Prize-winning physical sciences research groups. Located on the university’s main campus south of downtown Chicago, the building houses the university’s Department of Astronomy and Astrophysics, the Kavli Institute for Cosmological Physics, the Institute for Molecular Engineering and the Dean’s Office of Physical Sciences. It includes state-of-the-art laboratories, offices, conference rooms, a 150-seat conference facility and a café. Conducting research here are world-leading research teams working across multiple disciplines in the fields of chemical, electrical, mechanical and biological engineering as well as the traditional materials and physical sciences. Five floors above grade provide flexibility and infrastructure for different lab types ranging from optics to chemistry. Two of the center’s seven floors are below grade, enabling the university to isolate highly specialized labs, including the Pritzker Nanofabrication Facility cleanroom and a high bay assembly lab, from vibration and electromagnetic interference. 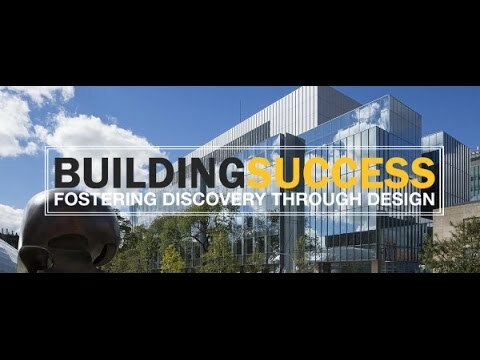 HOK’s team designed every aspect of the Eckhardt Research Center to foster the interdisciplinary collaboration required to generate scientific breakthroughs. Carefully planned interaction spaces include a large conference facility, pre- and post-event space, a café, light-filled hallways and highly coveted corner collaboration areas with open views. Each floor is considered a neighborhood, with a home base at the north end providing the largest gathering spaces. On the building’s top floor, an open balcony provides a view of the Chicago skyline to the north. Glass is used extensively on the exterior, linking people to nature and allowing for light to transform the building’s facades throughout the day. James Carpenter Design Associates served as design consultant to HOK in the creation of the dynamic building enclosure. Each facade is uniquely responsive to the site and its public realm, harnessing light as an organizing principle for the building’s performance and human experience. 277,000 sq. ft. / 25,735 sq. m.
Watch the University of Chicago’s William Eckhardt Research Center project team describe the innovative techniques employed during the design and construction of this groundbreaking new research facility. Team members from the University of Chicago, HOK and W.E. O’Neil Construction gathered at the site of the university’s new William Eckhardt Research Center for the building’s topping-out ceremony.